Why do I want to discuss this topic? Because parenting styles are the key to successfully raising a responsible boy. What is it exactly? "A psychological construct representing standard strategies parents use in raising their children." 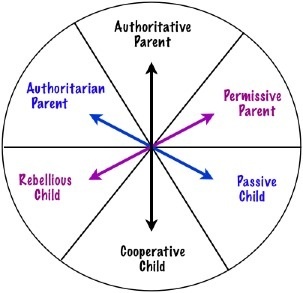 Because research has shown that parenting styles were strongly linked to the outcome in child behavior, I believe it is important to look into these styles. My bet is that most parents don't usually research this subject prior to having children. It's probably not something that you looked into and thought "What style should I choose?". You probably did give it some thoughts though, such as "I will not do as my parents did" or similar thoughts referring to your own childhood experience. However, this is not really what I would call choosing a style on the basis of research. I'm sure most of us are familiar with these styles and know approximately what they mean but I think most people don't realize the effects that these can have on children in their later life. However, I think that we - parents - probably vacillate between different styles at different points of our parenting journey. It is useful to see these styles as a kind of continuum with the Authoritarian Style at one end and the Permissive Style at the other end (I will not include neglectful here). We might be more or less in the middle most of the time but I'm sure that we sometime lean on one side or the other. Pawan Verma believes that permanent child discipline can be achieved only by way of love and by no other means or methods. The selective use of specific discipline techniques serves the purpose if you use them with lots of love. He believes that it certainly works where punishment, scolding, spanking, nagging have failed. I agree with him and I invite you to visit the great website he has created: child-discipline-with-love. Consistent Parenting Advice believes that being a consistent parent is both vitally important and totally necessary to ensure a happy family life. This website addresses HOW to adopt a firm, clear, consistent parenting approach, while enabling you to enhance and increase your emotional well-being.